It’s the first time scientists have been able to map out clouds on a world outside of the solar system. If we can see clouds, then we can begin to think about what a planet’s climate will be, making this an important milestone in understanding the conditions on other worlds. 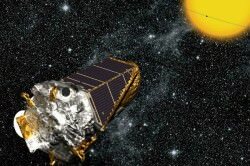 Preliminary observations with the Kepler space telescope –which was designed to hunt planets until a second reaction wheel failed earlier this year — found “moon-like phases” on Kepler-7b. These showed a bright spot on the western hemisphere. Something was clearly going on, as the planet is extremely close to its star; only 0.06 Earth-sun distances away. The temperature was too cool. They figured out that the light was reflected off cloud tops on the planet’s west side. Another cool fact — Kepler-7b, like Saturn, would float if it was put in a big enough tub of water! You can read more details in the technical paper online here. The study, which was led by the Massachusetts Institute of Technology, has been accepted to the Astrophysical Journal, but not published yet.